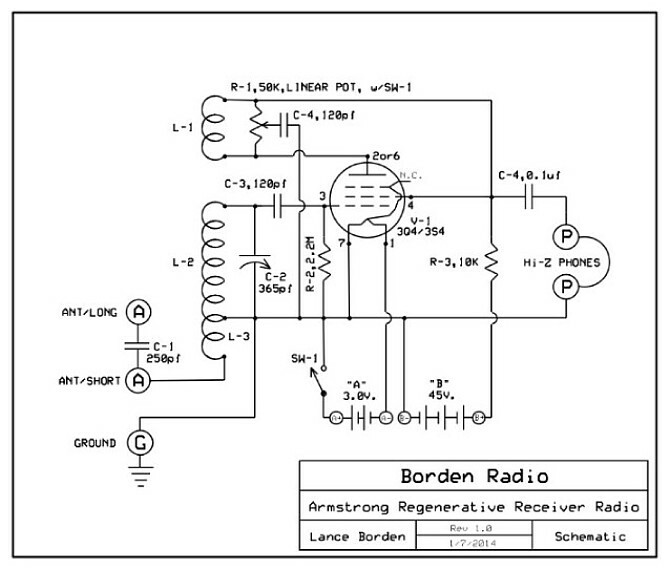 Borden Radio "Armstrong one tube Regenerative Receiver"
As stated on the Borden Radio website, the kit contains all high quality parts. The pre-drilled base is furniture grade pine, and the heavy cardboard coil form is already coated in polyurethane. All parts are included, even the hookup wire and felt "feet" for the bottom. You'll need to supply your own batteries; two "D" and five 9 volt. Solder lugs are are included with the kit to make hookup easy, and the connections will remain tarnish free for the life of the set (virtually forever.) The labels are also provided. The kit comes with a ten page pamphlet. In this pamphlet, along with the instructions to assemble the kit, are a brief history of the vacuum tube, early radio development and notes on Edwin Armstrong and his invention of the regenerative radio receiver. There is also an explanation of how the radio works, what the vacuum tube does, and how to operate the radio. 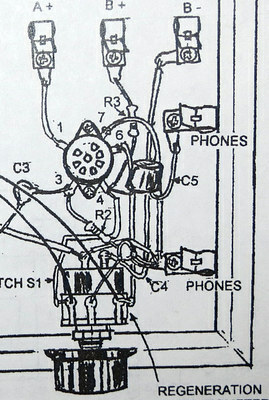 There is a very nice schematic diagram of the radio with a parts list, all on one page. What I really like about this set is the circuit itself. Most one tube regen radios have the 45 volts B+ going through the headset. This one doesn't. There are no problems with stray capacitance in the headset cord to throw you off while tuning a weak station. Also, an audio amplifier can be connected without altering the circuit. It is surprisingly immune to hand capacitance while tuning it. Assembling the set was a bit of a challenge, not because it was inherently difficult, but because of the instructions. 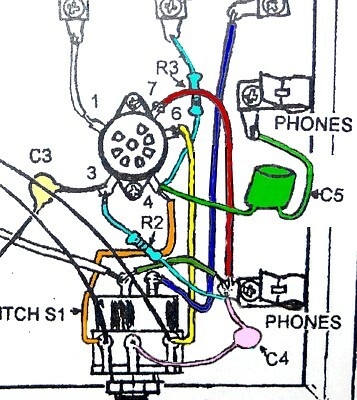 The image to the left is a part of the wiring diagram. This, and a black and white photo are what you use to wire the set. We ended up referring to the schematic diagram time and again. Adding color to the drawing makes it readable. Now we come to an unexplained problem with the set. The low station on the AM dial here in the Philadelphia, PA area is WFIL, AM 560. The radio wouldn't tune down that far. Why not? Did Matt miscount the turns while winding the coil? 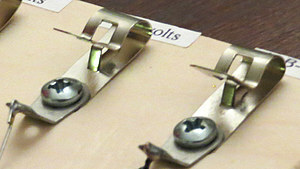 The number of turns on the coil were counted THREE times and were found to be perfect. (20 turns, a tap, and 55 turns, for a total of 75 turns of wire). So what exactly was it tuning down to? That was easy to figure out. A regen radio transmits on whatever frequency it's tuned to. All that was needed was to use a radio with a digital display and listen to the squeal from the regen radio. In this case, it tuned down to 570 kHz. Method used to count the turns of a coil: A blunt hard object is wiped over the wire and the number of "clicks" are counted. (The corner of a credit card works well.) This can be an exercise in concentration! 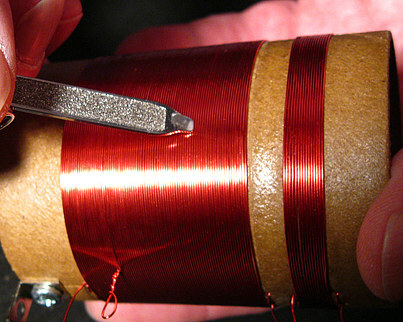 It is also useful while winding the coil if you become distracted while counting. In this case, the number of turns was exactly what the instructions called for. 20 turns, a tap, then 55 more turns. After looking at some radio websites and online coil calculators, it became apparent there weren't enough turns to tune down to the low end of the band. The coil was removed from the set and a new coil was wound on the same coil form. The new coil has 21 turns, a tap, and then 61 more turns, for a total of 82 turns. 26 gauge wire was used, same as the original. 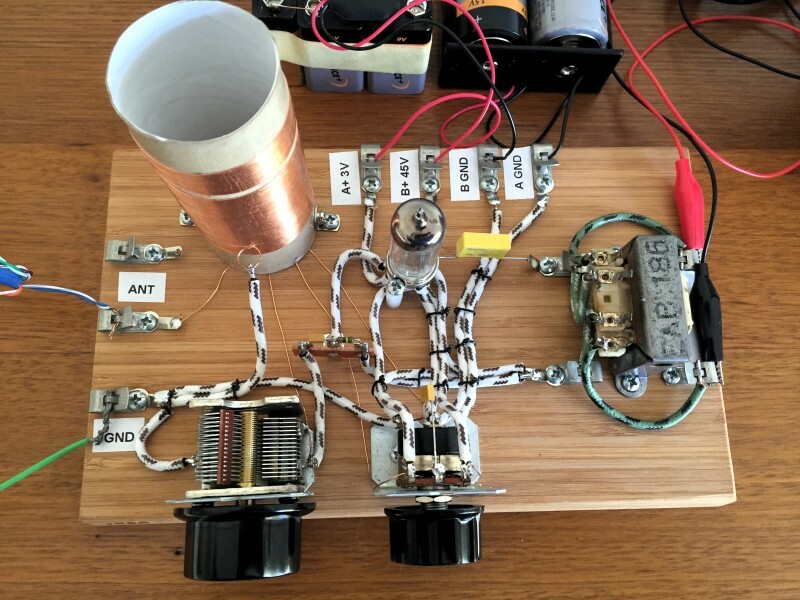 With the new coil, the radio tunes from 540 to 2000 kHz. I was surprised to hear Morse code up at the higher end. WFIL (560 kHz) sounds a little "mushy" so I think if I were to make another coil I'd add more turns and bring it up on the dial, sacrificing the Morse code on the other end. The big question is this: Do every one of these Borden radios have the same problem? Maybe the coil was fine and the tuning capacitor is out of spec. There are photos of seven completed radios of this design on the xtalman website, and in 2004 the set appeared in CQ Amateur Radio magazine. Perhaps hundreds have been built. Did we get the oddball? It turns out we didn't. In a radio forum a guy asked why he couldn't tune in a station at 580 kHz on the set. One answer was to put a capacitor of 100 pf across the tuning capacitor. That would be easier than rewinding the coil! Well, it works now. Troubleshooting this was all part of the fun of building it! Number of turns for 2" diameter coil. 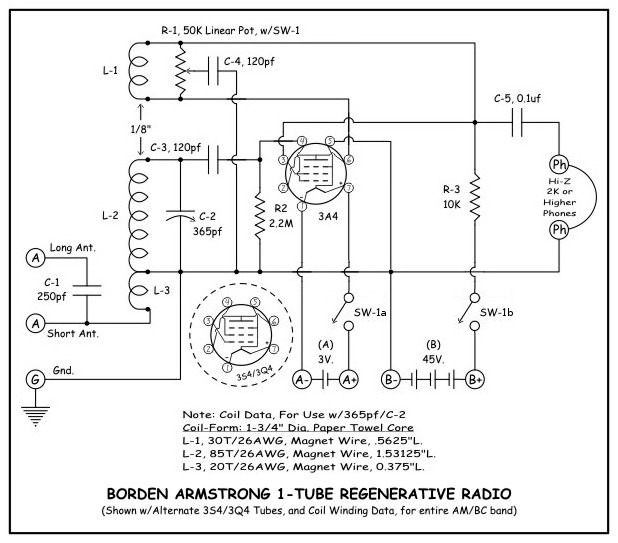 Alternative schematic, tube and coil data. Thanks to Mike Peebles. Note connections on pins 3 & 4 of 3A4 tube are reversed compared to 3S4/3Q4. FYI, tube diagrams show the pins as viewed from the bottom of the tube. 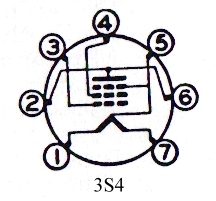 Pins 3 and 4 are reversed on 3A4 vs. 3S4 as noted above. The 3A4 was designed 2 years after the 3S4 and has a higher output. A Borden clone with alternative filament hookup. 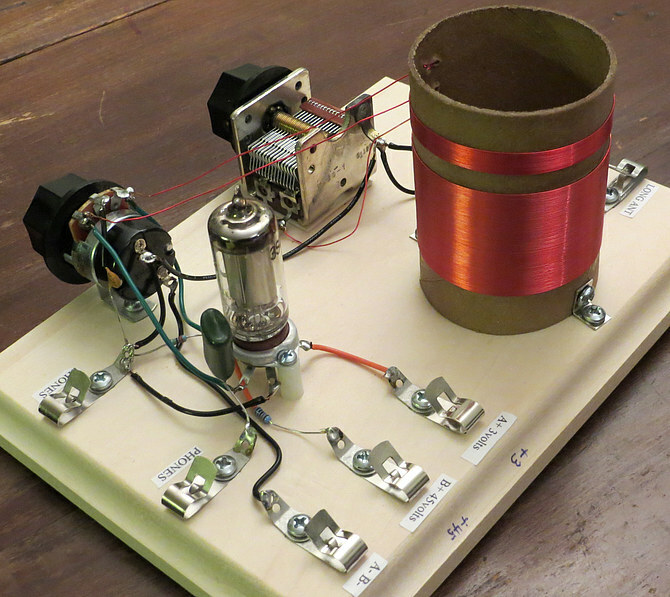 "\Milorad" built this clone using a 3A4 tube. The object on the right is an impedance matching transformer for the headphones. As in the schematic above, he wired the filament battery to pins 1 and 7. When he attempted to increase the "B" battery to 54 volts, the filament opened. The 3A4, 3S4 and 3Q4 actually have two 1.5 volt filaments in series, with a tap at pin 5. Seeing that only one of the filaments opened, he successfully operated the other with a 1.5 volt battery, but when he increased the "B" battery to 56 volts that one also opened. After some discussion as to what the value of this resistor should be, another way to connect the filament was (re)discovered. The filament voltage can be wired to "float" by omitting the connection of pin 7 to "B-" and connecting pin 5 to "B-" instead, as in the schematic below. 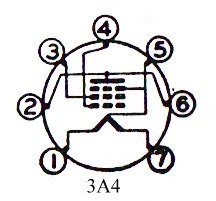 Notice the connections to pins 5 and 7 of the 3A4. "/Milorad" reports that the radio is louder wired this way. See the entire discussion here. Note: No one has been able to explain why increasing the plate voltage would cause the filament to open. As an experiment I added 9 volts to the Borden set, bringing the plate up to 54 volts (the volt meter actually read 58 volts.) It had no effect on the tube filament.